Alex: Glascuen is Alexander Burnet, Bishop of Glasgow. Marquess of Douglas divorced his wife and the subject of a popular ballad. Earl of Linlithgow Major-general and superior of Claverhouse but made a hash of things after Drumclog and replaced. John Paterson, Bishop of Ross died January 1679. George Mackenzie, Viscount Tarbat, later Earl of Cromartie. the Earl of Mar who commanded the militia regiment. 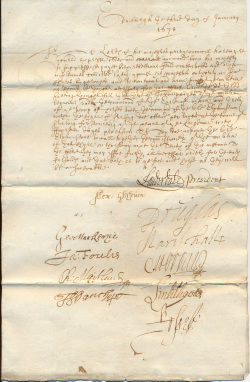 The Lorde of his majesties privy councill having re-ceaved expresse order and command from his majesty to suppresse disquyet both rebellious feild conventicles and other insolencies councilled latly against his majesties authority in some shires paruches [parishes] and to convecat and arme such of the militia as should be thought necessary for that effect. And the said lords haveing thought fell that thrie of the companeyes of the militia regiment under the command of the Earl of Marr and the other of the troup of horses under the command of Lord Elphinstoun within the shyre of Stirling doe attend per vices at the toune of Stirling for securieing [securing] of the peace of the Kingdome with ffourteen dayes provision. They doe impower the Lord Elphinstoun to call together the comissioners of the militia of that shyre on thursday nixt the Tenth of this instant to the effect they may issue furth all necessar orders for the ende forsaide and that both as to the foot and horse as they will be answerable.